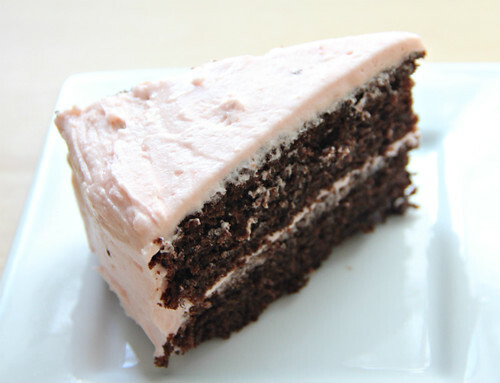 You’d never guess the secret ingredient in this moist gluten-free chocolate cake with pink buttercream frosting. Can you keep a secret? This gluten-free chocolate cake has a top-secret ingredient that keeps it rich and moist. No crumbly, dry cake here. The only catch is that you can’t reveal the secret ingredient to your guests, at least not until after they’ve devoured a piece of this delectable chocolate cake topped with a delicate pink buttercream frosting. Honestly, I’m not a huge fan of beets (too “earthy”), so trust me on this one: You simply cannot taste the beets in this recipe, yet they lend moistness, structure and depth to the cake. 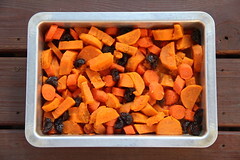 Similarly, sometimes I add applesauce to my gluten-free cakes: The applesauce makes the cake tender, and the fruit pectin keeps it from falling apart — especially important for gluten-free baking. When I was asked to develop two recipes for the Joy of Kosher Gold’s Foods campaign, I decided to make two very different recipes: a chocolate beet cake with Gold’s borscht and wild salmon with dinosaur kale and yogurt-horseradish sauce, using Gold’s white horseradish. For the Super-Moist Secret-Ingredient Gluten-Free Chocolate Cake, you’ll need to puree the borscht in a blender, to thoroughly incorporate any bits of beet. Borscht — beet soup — is liquidy. Adding 1 1/2 cups of borscht to the batter seems strange, but it makes the cake tender, with a light and airy crumb. 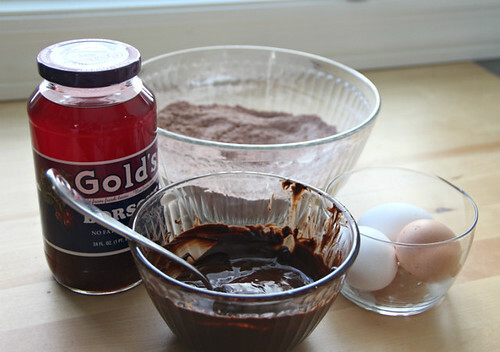 The surprising secret ingredient to moist gluten-free chocolate cake is … borscht. I frosted the cake with a pink buttercream frosting, tinted pink by a few tablespoons of pureed borscht. Again, trust me — there is so much sugar in the icing, you will never taste the beets. Using the beet juice is actually a great way to color the frosting without using artificial food colorings. 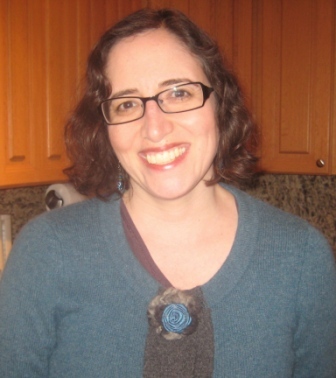 For the full recipe for Super-Moist Secret-Ingredient Gluten-Free Chocolate Cake, please click through to the Joy of Kosher site. 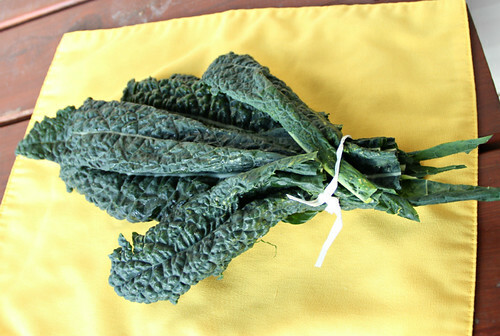 Lacinato kale is also called dinosaur kale and Tuscan kale. 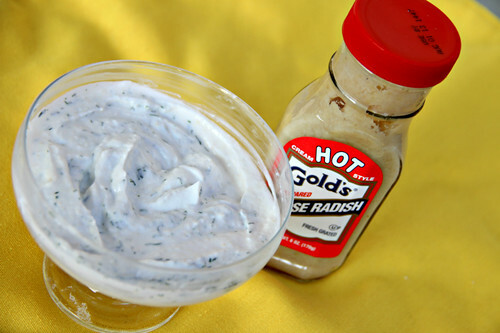 For a sauce, try this combination of Greek yogurt, white horseradish and fresh dill. Start by sautéing the chopped kale with diced shallots in a large skillet, adding a cup of vegetable broth. Then place the salmon on top of the kale, cover the skillet and cook over low heat for about 10 minutes. The salmon (feel free to use other types of fish) comes out silky and tender, which is good because I tend to overcook fish. For the yogurt-horseradish sauce, mix together 1/2 cup Greek yogurt, 2 tablespoons white horseradish and 1 tablespoon chopped fresh dill, and serve on the side. With a powerhouse combination of wild salmon, kale and Greek yogurt, this dish is both delicious and nutritious. 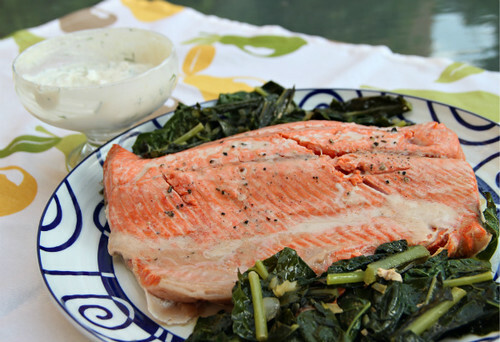 For the full recipe for Salmon with Dinosaur Kale and Yogurt-Horseradish Sauce, please click through to the Joy of Kosher site. This post is sponsored by Gold’s and Joy of Kosher.